The Temple of Heaven 天坛 Tiāntán is the place where Ming and Qing emperors were celebrating the rites and sacrifices to pay homage to Heaven and plead to give good harvests. His organization is linked to Chinese cosmology whose balance was based on the Emperor's attitude and respect for the rites. The colors, shapes, sounds and position of buildings representing this rather complex design of the universe. 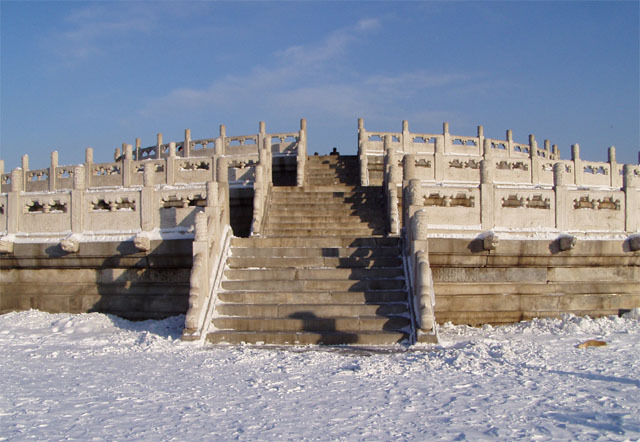 The Temple of Heaven is located at the southern end of the old city of Beijing, in the district of Xuan Wu. It has an area of ​​273 hectares, almost double of the Forbidden City. Originally called the Temple of Heaven and Earth, it was built from 1406 to 1420 during the reign of Emperor Yongle, who was also responsible for the construction of the Forbidden City. 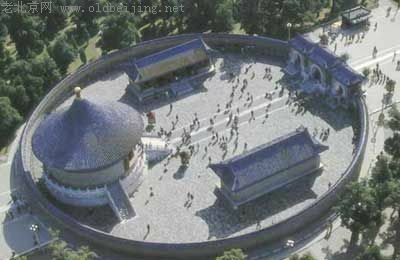 The temple was enlarged and renamed Temple of Heaven during the reign of Emperor Jiajing in the sixteenth century. 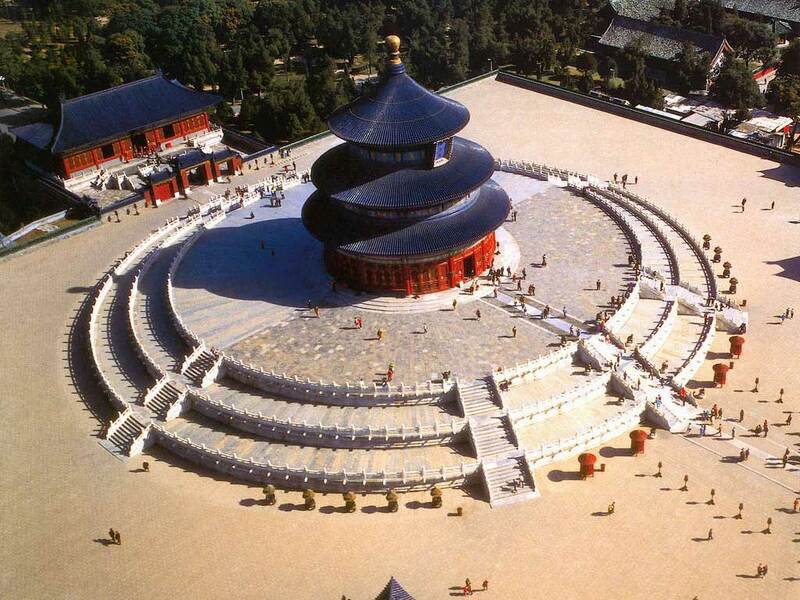 The Temple of Heaven was renovated in the eighteenth century under Emperor Qianlong. 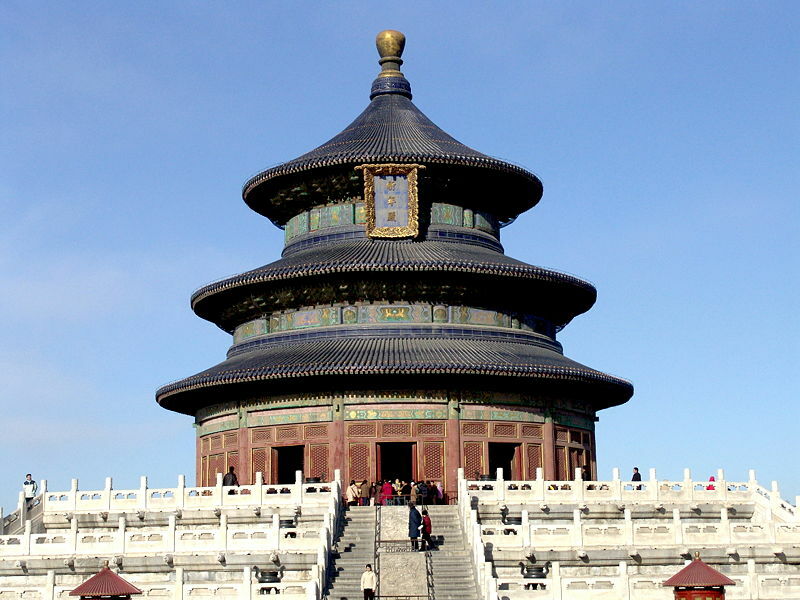 The Temple of Heaven was inscribed as a World Heritage Site by Unesco in 1998. Early 2005, a renovation of a 47 million yuan (about € 4'318'000) of the monument is undertaken for the 2008 Olympic Games in Beijing, but the renovations were completed on May 1, 2006. 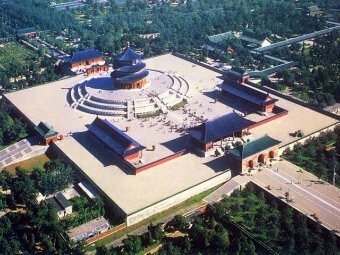 The Temple of Heaven is located in a huge park where you can come and admire the Chinese practicing Taijiquan and Qigong or practicing dance and singing. If we go by the south gate, we find first the Circular Altar. Built in 1530 and rebuilt in 1740 on a square base representing the Earth, the round altar (representing heaven) has three highest terraces. The center has a symbolic representation of the number 9. When you stand in the center, the noise we are doing by clapping or talking is amplified. It is a curiosity not to be missed and not always known to visitors. We must stand exactly in the center so that the effect occurs. The number nine and its multiples have a symbolic value: the leplus high number. Nine concentric circles radiate around the center stone: the first consists of nine stones and the last of 81 stones (9 by 9). The stairs that lead up to it are always in groups of nine. The altar is surrounded by 360 marble balustrades. Until 1911, before the fall of the empire, the emperor was celebrating a ceremonial offerings of sacrificed animals, alcohol, tablets jades and silks by prostrations always organized around the number nine. 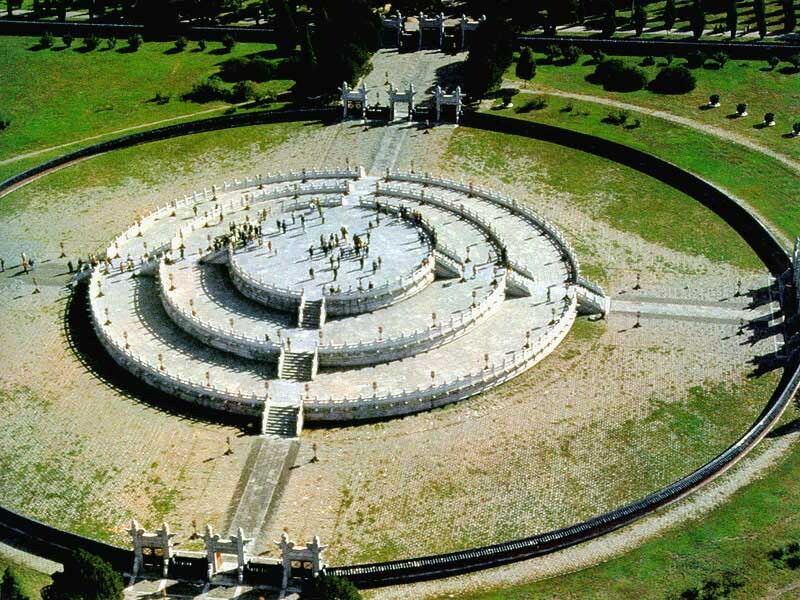 North of the Altar, a circular enclosure of 65 m in diameter called the Echo Wall encloses the Imperial Vault of Heaven. If there are no crowds, a whisper in the other side is quite audible. In the Imperial Vault of Heaven was kept shelves of Heaven and of died emperors. This octagonal building was built at the same time as the circular altar and in the same proportions as the Hall of Prayer for Good Harvests. The Imperial Vault of Heaven is flanked by two buildings. The one to the east contains beautiful paintings. It is dedicated to Yang: god of the sun, Polaris, planets, etc. One to the west is dedicated to Yin: goddess of the moon, cloud, rain, etc. It has a double row of beautiful multicolored beams. The three sound slabs on the driveway also has an interesting curiosity: if one claps his hands in front of the first plate a mere echo is obtained and if we repeated the experiment before the second, echo is double and triple front the third. The cypress of the Nine Dragons, outside, is older than 500 years! The Hall of Prayer for Good Harvests is a magnificent building on three terraces with marble bunk. The temple is 38 m high and 30 m in diameter, made ​​of wood without a single nail! Built in 1420, it was burned by lightning in 1889 and rebuilt identically. He is the symbol of China tourism. His picture is everywhere, with its triple roof of blue tiles. Outside, in the middle of the stairs, three stones represent the clouds, the phoenix and the dragon. Inside, four large columns symbolize the four seasons at center and 12 colones symbolize the twelve months of the year and yet another twelve divisions of the day. Finally, the last 28 represent the 28 constellations. To the east lies the Temple of Fasting. This is where the emperor and his ministers were observing a fast for three days before each ceremony. It is now an exhibition hall with various instruments of sacrifice, dating mainly from the Qing Dynasty. To the west of the park is the natural history museum with dinosaur skeletons among the largest discovered to date. There is also a section of botany, zoology and a collection of fossils.